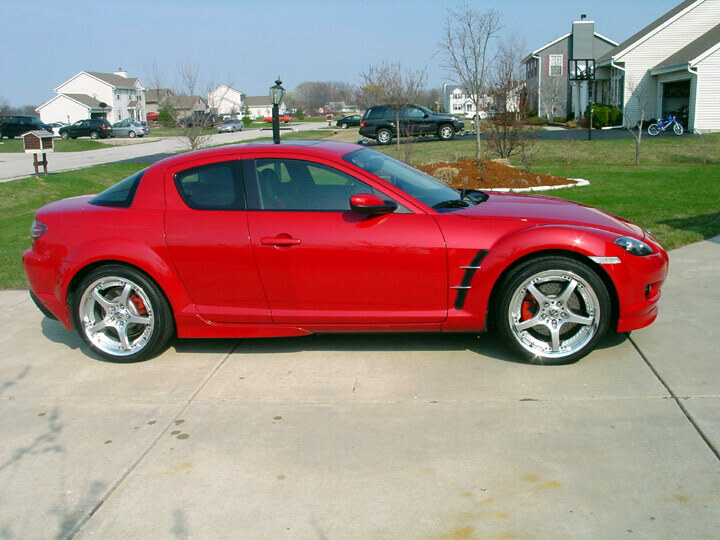 ok, I've seen 4 RX-8 within the past month while driving around town, and only of them look at me when I look to say hi. The last one I saw was yesterday, he didn't even turn his head stopping next to me at the light, and just took off on green like he has a faster car. sure. what's up with that? Looks like we have enough people for an Wisconsin meet, somebody do it!! Sounds like a good Idea, but where? By the way are you heading to blackhawk on May 27 for the Midwest counsel event? There's one on May 27? I didn't know that...umm, tempting, but I have a autox that day...how much is that one? I saw a black one (possibly you), a couple gray, and the silver one yesterday. I saw a red one parking at the mall, which could be from anywhere; and I know there's a red one local, because I saw him at autox last year, and I know he work in town. Jay, are you coming to the lapping day at Shawano on th 13? Not very fast since it's a cart track, but lots of fun. Cheap too. It's $160, I'm gonna do this or the one at Autobahn country club on the 20th. I'll know which one this weekend. Last edited by devildog1679; 05-03-2007 at 12:55 PM. As much as I want to, I need to invest in a helmet yet and some newer tires before I do that. I can spot you on the helmet, can't help you on tires though. What better way to finish off the old tires PM me know if you like to come watch, we can head up there together. I think I saw that car at the dealership the other day....doesn't look like we have a lot of local Appleton owners here on this forum. o yeah and the dent mod from some idiot! Not too long ago I saw a blue RX8 sitting in a parking lot outside a bar in Racine. Wonder whos it was. Just last week, saw another RX8 in black on Hwy 11. Quite a few in this area. I'll wave next time. Summer only - man, it is so much fun. Other car: 99 blue Mustang 5-speed primary car had it for 8 years - the Sin mobile - not as fast but still love it. With all these members in WI we should get some better track turnouts. yes yes yes....anybody has time to organize a meet? It'll be nice to meet the new people here. Oh, anybody here going to Indy for the F1 race this weekend? I spoke to Troy (he's running nthe event) He said that a M rated helmet is OK as long as it M2000 or better. They may even let you get away with a M95 rated helmet. I think they are having a hard time filling the event up. I signed up for the 23rd originally. Called it off after I talked to them and they give me refund. I'm going to hate myself, going or not, so might as well do that with $150, helmet and gas money in my pocket.